Disclosure: I participated in an Ambassador Program on behalf of Dad Central Consulting for Discover Boating. I received a promotional item to thank me for my participation. It has been a summer full of travel and adventure for our family. Since we live less than 10 miles from Georgia’s Lake Allatoona, nearly every weekend is spent in or around the water. Lake Allatoona is situated on the Etowah River, a tributary of the Coosa River. The serene lake and peaceful surroundings offer a wonderful respite from the rush of city living. This like is one of the most frequently visited Corps of Engineers lakes in the nation. Nearly 7 million visitors visit Lake Allatoona and each year enjoy the countless opportunities for camping, boating, and observing wildlife along the beautiful shoreline. Even though my daughter is only two years old, she has learned the basics of fishing. I know it will only be a matter of time before she catches a fish on her own. Boating and fishing go together like….well, you know the rest! Kids enjoy feeling included, and what better way to instill some responsibility in your children. Depending on their age, give them small things for which they are responsible, such as ensuring that everyone has a personal floatation device, or teaching them to coil a line. Kids like to stay active. Plan an outing on the boat that includes water activities such as snorkeling, tubing, looking for wildlife or learning how to fish. Introduce your child to fishing. Use this time to gather as a family and create lifelong memories. Plan short outings such as a picnic on the boat or let the kids find anew creek or lake on the chart and plan a picnic at that destination.This creates a sense of adventure and allows valuable family time together. You can let your kids invite a friend or relative along to share in the fun! 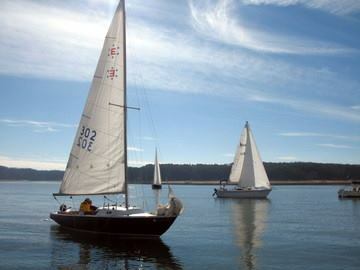 DiscoverBoating.com has great resources and educational tools for boaters of all levels! Please visit some of the links below for some great information!